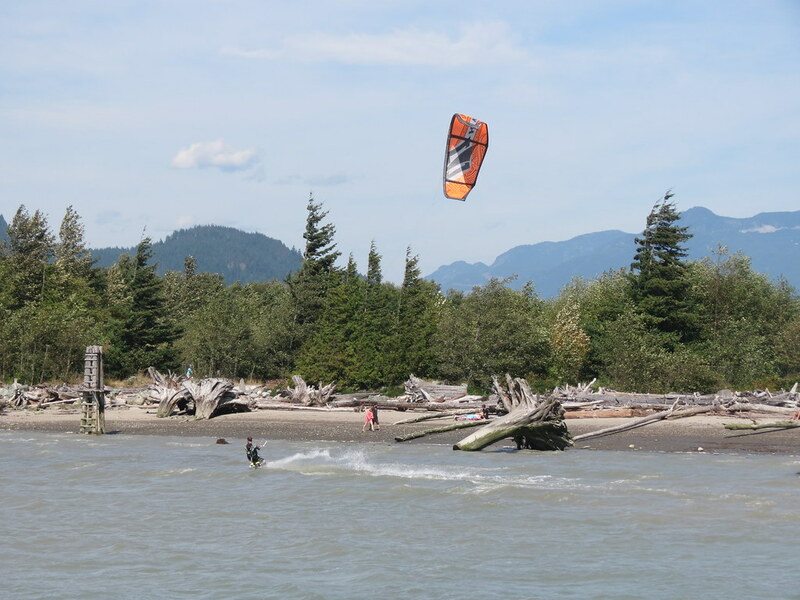 Nexen offers a family-friendly alternative to the Squamish Spit with sandy beach for the kids, several walking/biking trails that connect to the marina brewpub area which is within two blocks of downtown (lots of shops and restaurants). The only downside is when it is windy enough to sail it is windy on shore at the beach. But you only have to go a couple hundred metres down the trails to escape the wind. Protected cove with shallow flat-water summer thermals. Open water bump and jump summer thermals! 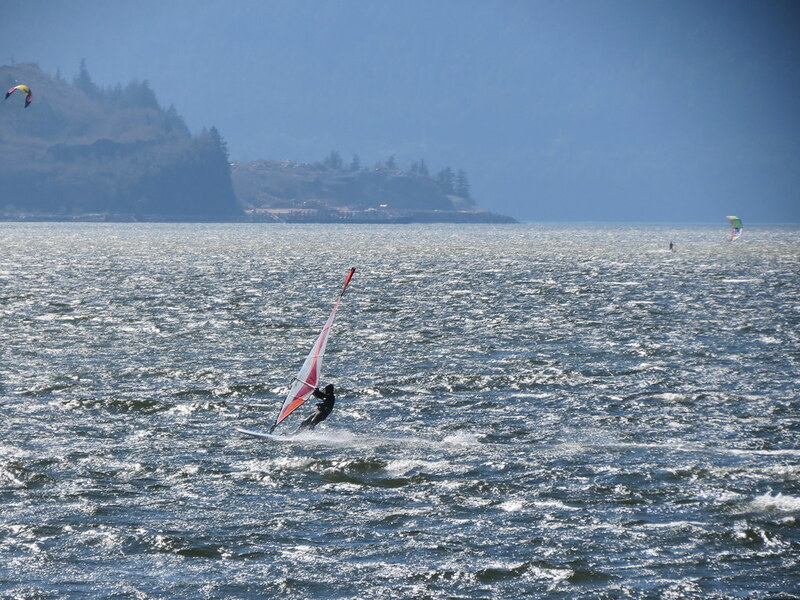 The wind at Nexen is generally similar to that at the Squamish Spit, although Nexen usually gets wind later, has less wind and looses wind first. The exceptions are the days when the wind is strong, shore-to-shore, and/or wind has a lot of west in it (which can favour Nexen). On lighter days its best to head for the Spit. 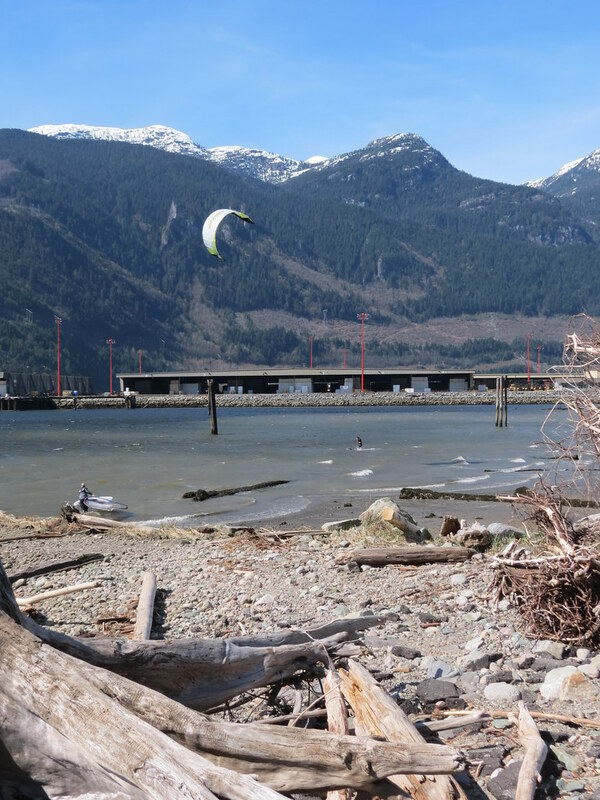 Click here to view the wind data and summary for Squamish Spit. South-southwest through southwest (inflow) wind is the predominant direction as shown by the way the wind-shaped trees grow and there is also some north (outflow) wind - but this direction is not sailed at Nexen as it is straight offshore. It can be tricky sailing upwind to get out of the cove (as the cove is narrow and there are obstacles like the piles in the cove and off the end of the point). Afternoon thermals – you can work the morning in the city or sleep in and still get a session in! 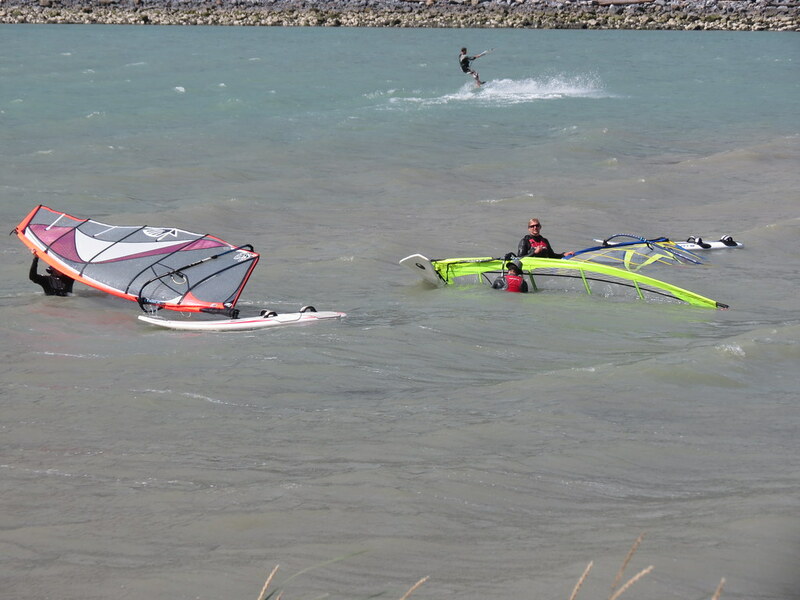 Water conditions at Nexen can range from fairly flat on lighter days to decent rolling bump and jump conditions (knee to waist high rolling wind swell with some steeper faces). Water conditions on the bank out in front of (south of) Nexen and in the cove are often very similar, unless the wind has a lot of west in it and then the wind becomes side-off the terminal causing the cove to remain flatter. 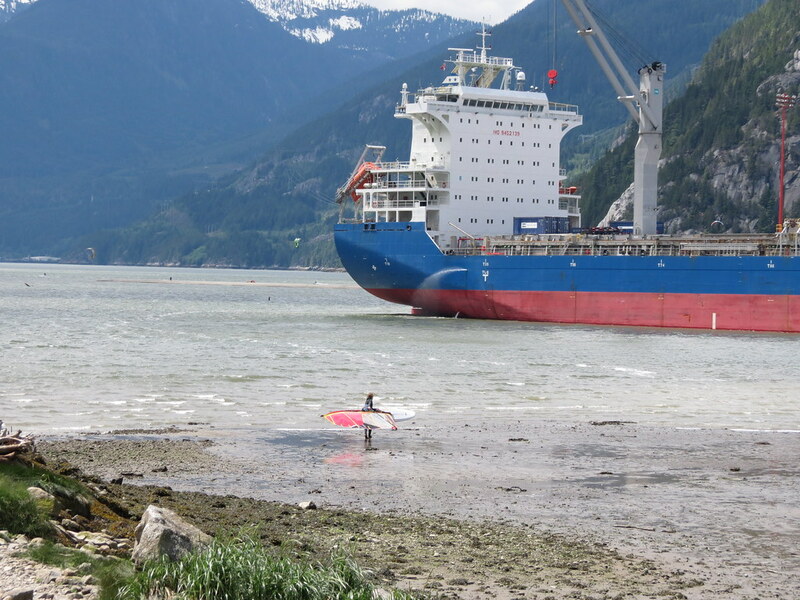 It is possible to sail out into Howe Sound and up to the Spit at the Squamish River from Nexen. 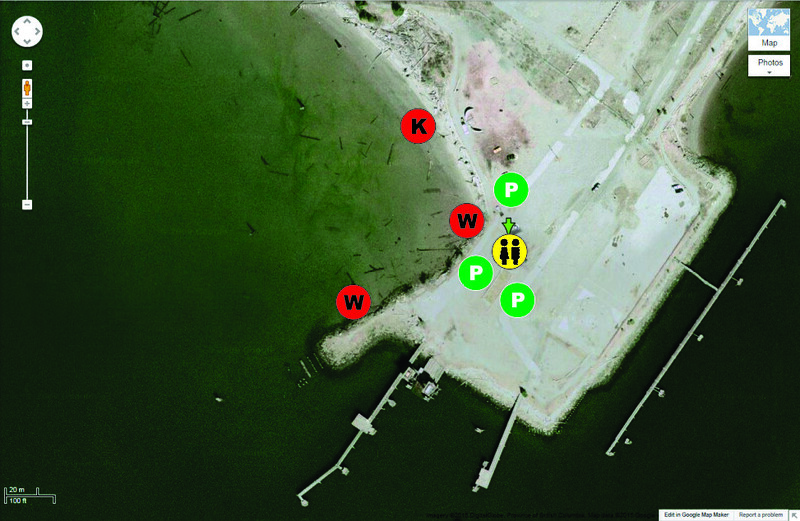 Click here to view a description of the water conditions off the Spit, including the sound, the estuary and the river. 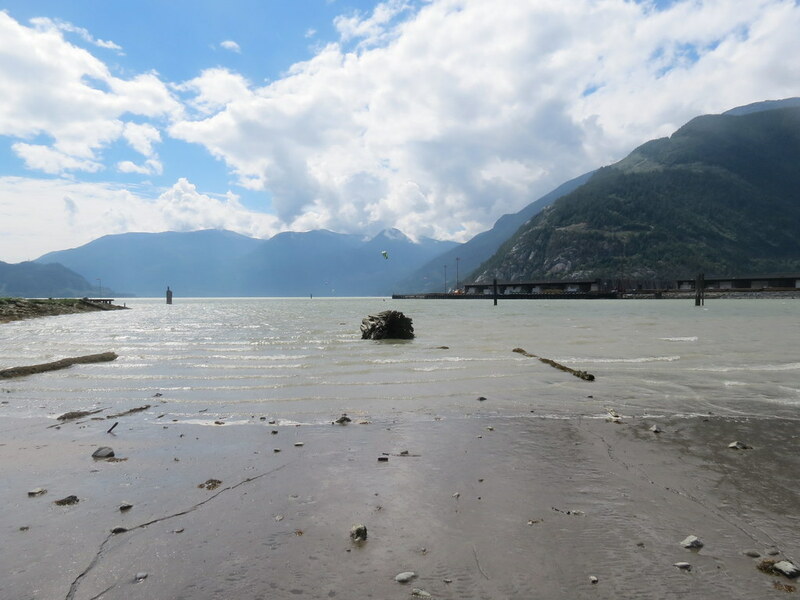 The cove is similar in width to the Squamish River at about 300 m wide by about 150 m from the beach to the open water. 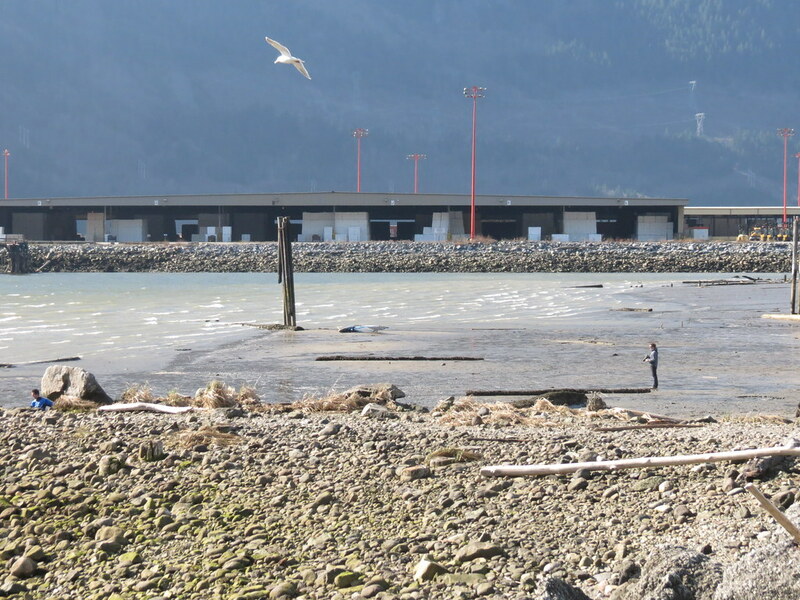 The water over the bank to the south of Nexen (between the Squamish Terminal and the east shore of the sound near the Malamute Bluff) is about 1 km wide and 350 m from the mouth of the cove to the open water of the Howe Sound to the south. Beyond the Squamish Terminal and the Spit the Howe Sound opens up to a width of about 2 km. Nexen provides a great option for those who want a more space to rig and/or want to be able to stand on the bottom of the cove. It is possible to sail at the Nexen on any tide height, although a short walk across the exposed bank may be required on a low tide. 3 m – Water in the cove almost all the way up to the edge of the beach in the cove. 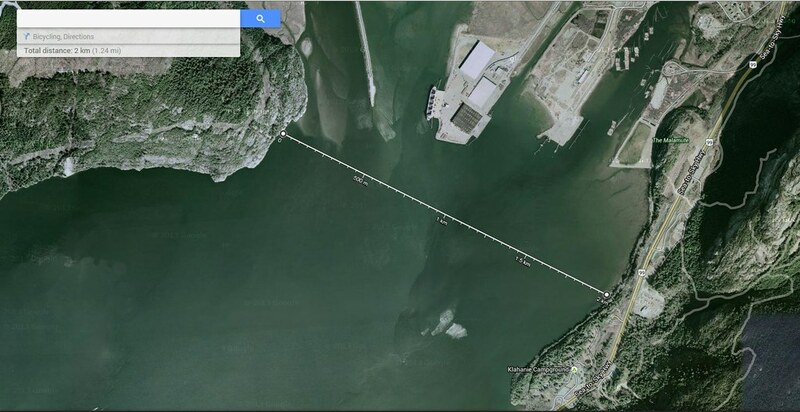 The water depth is fairly consistent east-west inside the cove (with the exception of sunken logs and other debris). Nexen offers way more space to rig than there is at the Spit. 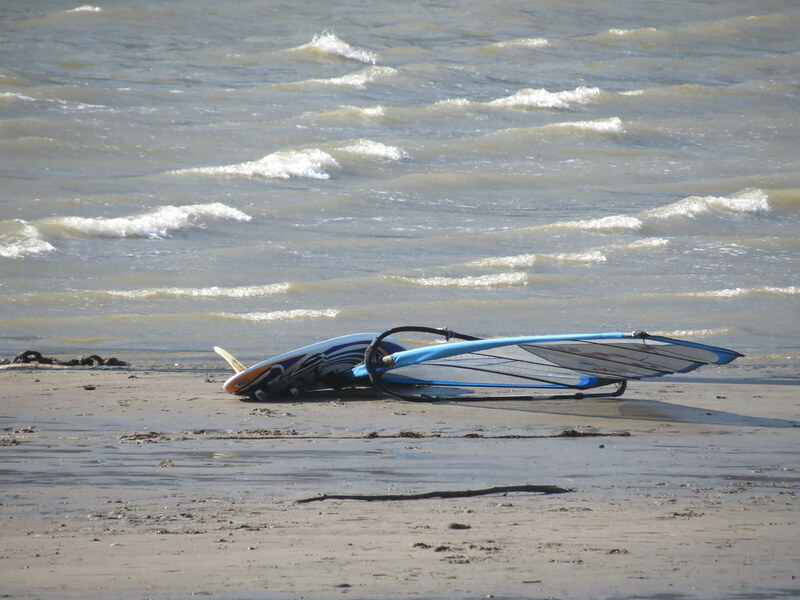 Launching at Nexen is likely easier than the Spit for windsurfing (no river current and clean wind) but likely harder for kites (on-shore wind, bottom of cove, piles). On high tide it may not be possible to launch from the beach at the north end of the cove (as tempting as it might be, you might not be able walk far enough into the wind prior to launching your board) - if the water is high you may have to walk your board up to the windsurfing launch on the point (marked with a "W" on the site map above), return back to launch your kite near the slack line park and then walk your flying kite up to your board at the point to launch your board. As you are walking your board up to the point make sure to scope a route that you will be able to safely walk your flying kite up to the point. For more details click here. Predicting wind at Squamish is as much an art as it is a science as there are several contributing factors including pressure (infow or outflow), thermal (temperature gradient from Vancouver to Lillooet), and cloud cover. 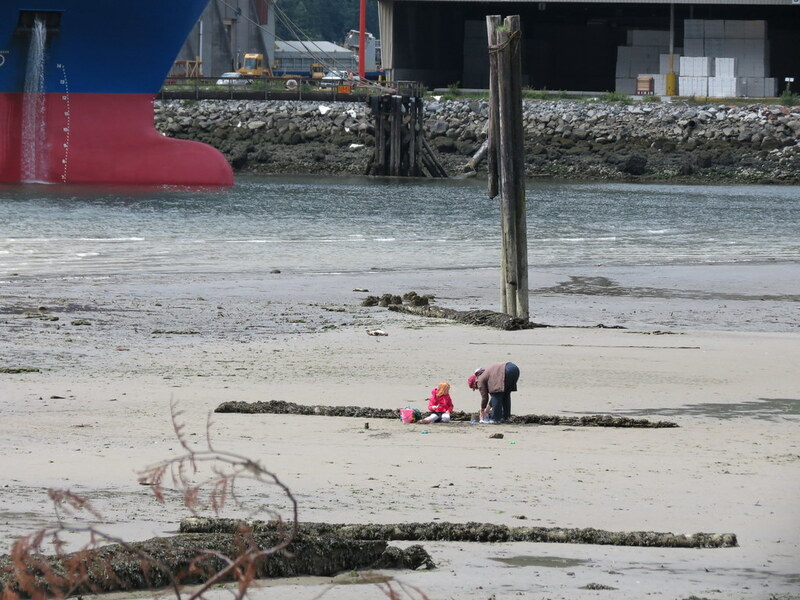 Click here to some tips on what to look for at the Squamish Spit that also apply to Nexen. Every sailor is responsible for sailing safely, including checking local conditions first hand, choosing appropriate gear and sailing within their ability. Have fun, sail safe! Thanks to the District of Squamish for operating this great sailing site. Thanks to Alton, PeterG, Igor, and Rob for sharing their local knowledge. /edit (2015 Mar 4): Caution for kite board launch on high tide added to "Launch" section (thanks Slappy). Last edited by C36 on Sun May 24, 2015 9:49 am, edited 9 times in total. Might want to include something about high tide while kiting. It can be rather tricky to walk up to the point on all the rip rap when the water is too deep to get far enough with the on-shore wind. I wish they would have buried that electrical line for the tugs instead of running it overhead. Because of it the trees are left there to keep kites away from it and thus make the walk over very hard. Great write up though, thanks for all the hard work. I especially like the inclusion of all the pics. 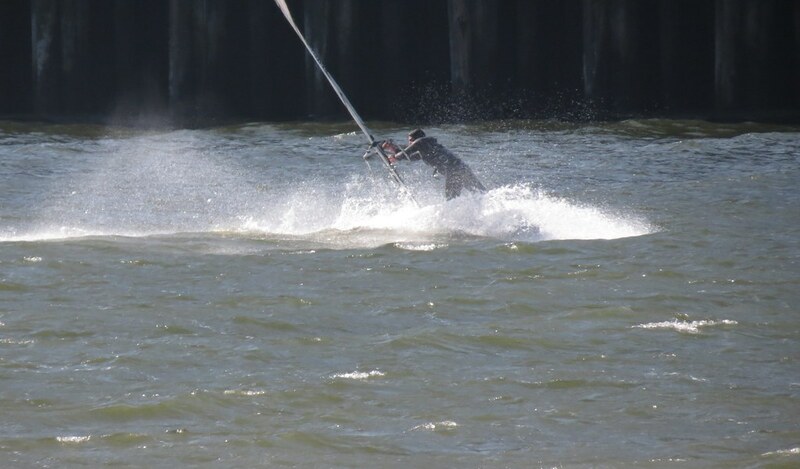 Slappy wrote: Might want to include something about high tide while kiting. It can be rather tricky to walk up to the point on all the rip rap when the water is too deep to get far enough with the on-shore wind. Will do for the power lines - just want to make sure I understand the ones. (1) Are they the ones that run down to the docks on the south end of the point through the parking lot just to the east of the cove shown here, here (click once to enlarge)and here? (2) What's the highest tide you can comfortably launch a kite in the cove on? Not sure I've ever seen a kite launch off the point (that wouldn't be easy). Thanks. yeah, those are the ones. I'm not sure the exact tide levels. I marked up this street view pic with yellow for the power lines, blue for high water and red for the route you take with your kite before you can launch. I would strongly advise carrying your board out to the red X before launching your kite as it's way harder with your board in hand. Sadly usually your first instinct is to try and launch from as deep as you can on the beach though and then when you can't make it you fall back to starting from the point. Just to be clear, you still launch your kite from the bark mulch near the slack line park. I'm just talking about where to launch your kite+board to try and beat up wind here. Slappy wrote: yeah, those are the ones. I'm not sure the exact tide levels. Thanks - got it. I've added some text under the "Launch" section - please let me know what you think. Craig wrote: I am an avid Nexen launcher and can say that it would be much more condusive to family happiness. Fam can walk down several trails to the marina brewpub area and are then only two blocks from downtown. We go to nexen as a family just to go for a walk. Sandy beach for the kids. Bring some sand toys. Bikes Etc. 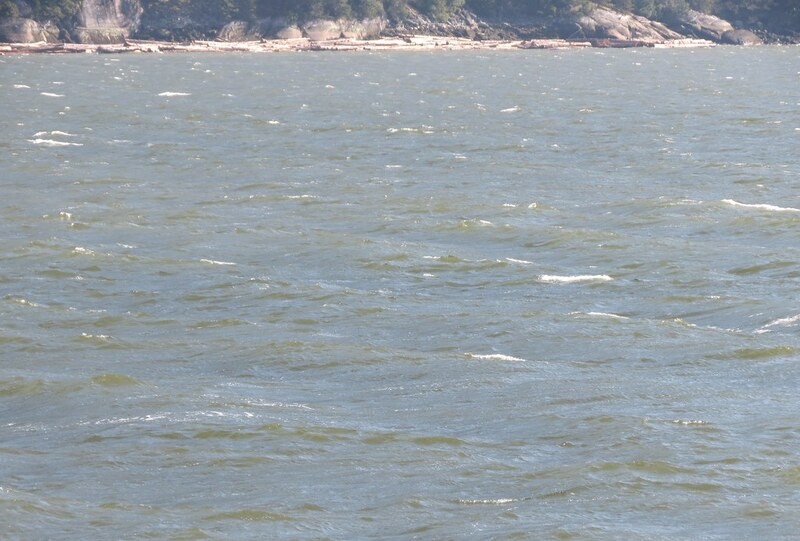 The only downside is when it is windy enough to sail it is windy on shore. But a couple hundred m down the trails ther is no wind. Hopefully see you on the water Sunday. Slappy wrote: Nexen is 10x better place to hang out than the spit. The down side is the wind is less there especially when it's got a lot of west in it (which it does early/late in the season). It also dies there first. You also have a tricky start directly upwind with pilings all over the place. When the wind dies at Nexen you end up back at the beach though. Nexen is not foil friendly either. Both the old ship and the two 'cans' are no longer there, so the 'playing field' of rolling swell/ramps that can form just south of the harbour entrance is more open (and less spooky).